It's autumn and you know that entices me to spend more time in the kitchen baking. There is just something about apples, pumpkin, pure maple syrup, cinnamon, cloves, ginger, molasses, nutmeg, etc. My mind starts racing how to incorporate them into something sinfully delicious everyday. 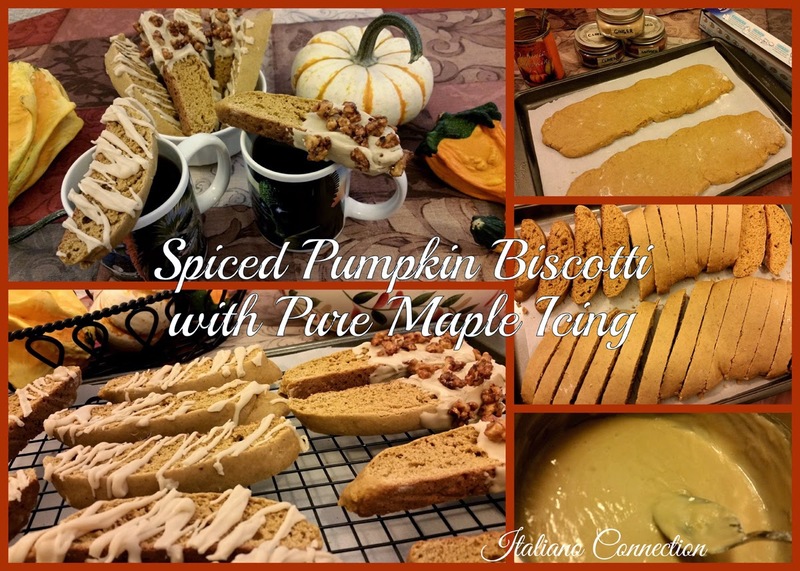 My children don't mind, but my husband is not a fan of the texture of pumpkin pie, yet he loves "pumpkin flavored" treats, such as my pumpkin bars with mascarpone icing. Some dipped in Maple Candied Walnuts too. 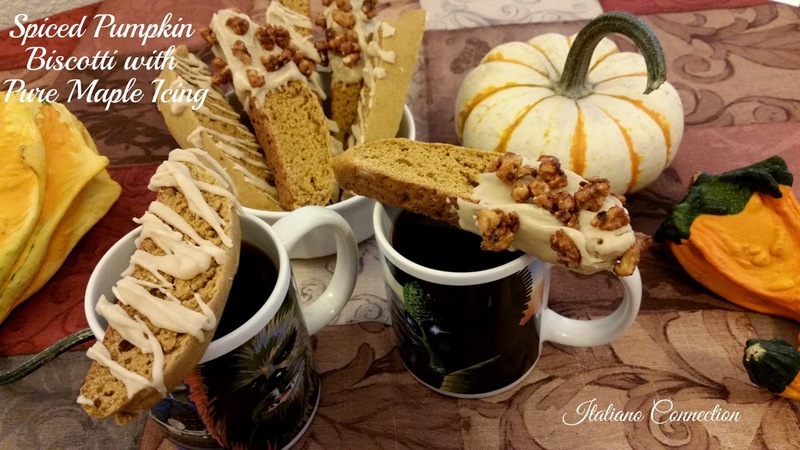 Today's treat Spiced Pumpkin Biscotti with Pure Maple Icing (and some with Maple Candied Walnuts on them too) is inspired by Trader Joe's Pumpkin Biscotti. I moved up to the mountains, in a bit of a remote location. I love it here more than I can say, but I miss being near my specialty stores such as Trader Joe's and Cost Plus World Market. Now I enjoy nature daily and have plenty of room for fruit trees and a garden, but when I go down to the valley, I stock up on the goodies that help me bake/cook terrific food. And things like biscotti are so simple to make, why buy them? Perhaps you will recall on previous versions of biscotti that I have shared this history with you about them? "Biscotti's root words mean "twice baked" which is befitting for this treat. Biscotto is the singular and biscotti the plural. In Italian biscotti means cookie or biscuit. Thus, biscotti are twice-baked cookies! For it is first baked into a loaf and then sliced diagonally into cookies and rebaked to toast the outside of this delicacy giving it a crisp outside and a texture similar to shortbread inside. In our family, homemade Biscotti is also consumed twice as fast, as store bought versions. 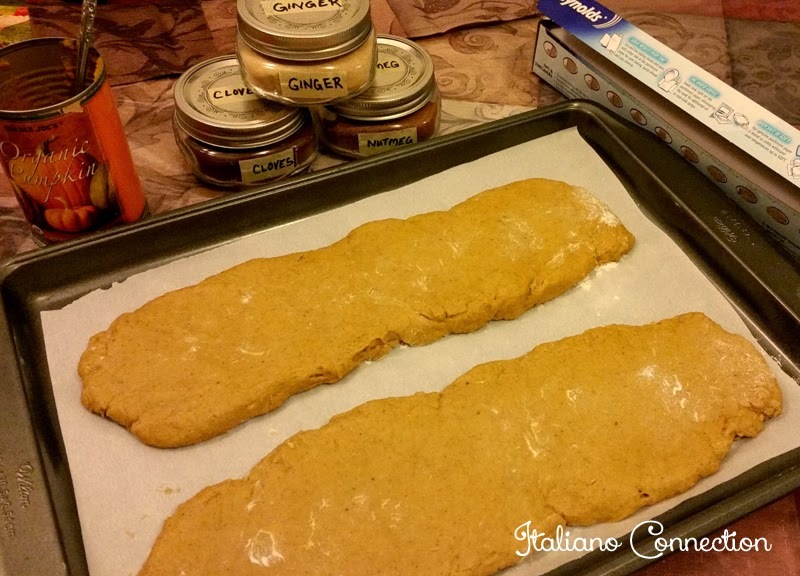 Spiced Pumpkin Biscotti logs before baking. Biscotti was developed in Tuscany and served with wine, such as Vin Santo. It is a dipping cookie, whether paired with wine, coffee, or tea. Coffee houses have found that customers love biscotti with their cup of cappuccino. They also make an elegant decor on top of gelato. Because Biscotti are baked so as to dry them out to prevent mold and they keep well in an airtight container for months at a time, sailors loved them, notably Christopher Columbus. The shelf life is approximately 2-6 months without preservatives, dependent upon your additions and how well they are dried out during baking." For the biscotti, I mix all the ingredients in the order listed into a large mixing bowl (use less spice if you don't like to taste it and more if you do). I add a bit more flour if they are too sticky, because it depends on how "wet" your puree is. Then I form two flattened logs on a parchment paper lined cookie sheet. Bake at 300 degrees for approximately 30 minutes. Remove from oven and let cool for at least 5, but not more than 15 minutes. Using a serrated knife I cut the logs diagonally into approximately 1 inch slices. Turn down oven to 200 degrees and carefully place each slice on its side, which will now take two cookie sheets. Place biscotti in oven and let dry out for the next 2-4 hours, turning at least once in the process. Or you can place your oven on its lowest setting and leave them in overnight. Either process will keep them from getting too browned, but properly dried out.